Small group for me is a weekly highlight! I get to hang out with four other guys and just talk about life. This week, one of the questions that was posed was “Who is someone in your life that you see and think ‘They have an AMAZING faith!’ ?” As we each took a turn sharing our answer, one of the guys talked about his aunt. The main thing that really had a positive influence on him was any time someone would ask her how she was, she always responded with the phrase “I’m blessed by The Best!” It instantaneously became my new mantra. When someone asks how we are, our first inclination is to turn to the circumstances in our life. We respond with “Well, my car broke down today on the way to work” or the typical go-to response of “I’m fine.” Why don’t we stop and think about the blessings we have been given when we are asked that question? Blessings aren’t circumstantial! God can bless us whether things are going well or if we are having a bad day. One thing I do every morning when I’m driving to work is pray – specifically that God would bless me in ways that: 1) I would know beyond the shadow of a doubt it was Him so I could give Him all the credit and glory AND 2) I would be enabled to grow and be strengthened in my faith. With Thanksgiving right around the corner, take the time to thank God for those blessings and find ways to bless those around you. How have you been “Blessed By The Best” lately? I thought he might be on to something, so I came up with one of my own. The word PROCESS stands for “Practicing Repeatedly Offers Consistent Examples of Success Stories.” For me, the word ‘process’ has always had a negative connotation because I want immediate results and don’t want to have to wait. Unfortunately, it’s not realistic to say “I want to lose 40 pounds!” and then immediately lose that weight right then and there without going through a process of exercising, eating right, and taking care of your body. It just doesn’t happen that way (no matter what those infomercial people tell you)! The process is what makes the end result worth it! You can look back and think how far you came and what you did to achieve your goal. Just like silver goes through a process to be refined, so do we as children of God (see Zechariah 13:9). Granted, it may be painful at times and you may wonder if that pain is worth the end result, but you’ll never find out unless you stick with it. We all knew someone in school who barely did enough to get by what was required of him or her. It really hit me hard when I thought that many times in life, that “someone” has been me. Colossians 3:23 (The Message) says “And don’t just do the minimum that will get you by. Do your best.” The NIV version translates the same verse this way – “Whatever you do, work at it with all your heart, as working for the Lord, not for human masters.” I always took the NIV version to literally mean work or my job. The more I reflected on the verse, the more I realized it was applicable to everything in my life. When it comes to my friendships/relationships am I just phoning it in? Am I doing the bare minimum as a leader? How about my health and taking care of myself? When I take inventory of my life, I can honestly say that I never want to find myself being average. In what area(s) of your life have you found yourself being “average” lately? Desiring God’s Will – Is It Really That Simple? How can we truly desire the will of God? The topic of God’s will can be very perplexing if we let it. We think of it as an equation: If I do “this” and then do “that” it will equal the will of God. It’s not quite that simple, or is it? I remember hearing someone say “Find where God is active in your life and join Him.” David G. Benner’s book Desiring God’s Will: Aligning Our Hearts with the Heart of God tries to shed some light on how we can truly desire God’s will, embrace it, and live in it. This book is the third and final book in a series (Surrender to Love and The Gift of Being Yourself being the first and second books respectively). Its seven chapters include: Ways of Willing; My Kingdom, Thy Kingdom; Love and Will; Choosing God; Will and Desire; Choosing the Cross; Developing a Discerning Heart. I think Dr. Benner puts it best when he says, “Surrendering to God’s will makes little sense if we are not convinced of the depths of God’s love for us.” He further discusses how we get confused about God’s will thinking we must “know” it rather than how to “choose” it. He also talks about how we on our own don’t have the willpower to truly desire God’s will…that it is something for which we truly need Him to act on our behalf. I highly recommend this book. It is more geared to those who are more established in their faith, but I also think that new believers would also be able to gain a great deal of knowledge from it as well. Please don’t wear a tank top if you’re this hairy! I’ll be the first to admit that I may not be the best person to tell others what to wear or not wear (there is a picture of me as a child wearing Sesame Street corduroy overalls that will be further proof of that statement). Last night, I was having dinner with a couple of friends at a local restaurant and in walked a group of what could only be described as hipster college students. One guy stood out in particular. He was probably in his early 20’s and had a full beard, but that wasn’t what you immediately saw. This guy had a good bit of chest hair and was wearing a tank top. When I say he had a “good bit of chest hair,” I mean it looked like he could have been part ape. If you’re that hairy, why would you even consider wearing a tank top out to eat? When I saw him (okay, the chest hair)…it made me think of a quote from the movie DodgeBall. Chest hair that is long enough to braid should be the first sign that maybe a tank top just isn’t for you! Don’t get me wrong, I have nothing against chest hair (I have a lot of it myself) but you should really think about how you look when you go out in public. I kept thinking “What if some of his chest hair ends up in his food?!? !” GROSS! Maybe they should offer a college class for us guys – “What You Should/Should Not Wear 101!” I know I could have benefited from it earlier in life (and probably even at times now…female friends have been a blessing for this straight guy when it comes to my clothes). 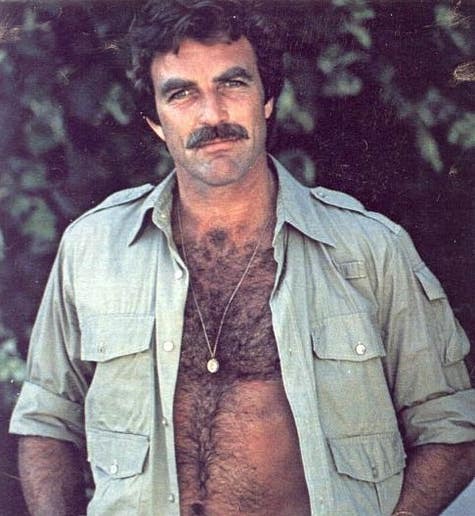 If your chest hair resembles that of Tom Selleck or Steve Guttenburg, maybe you should think twice before you consider going out in public wearing a tank top. You’ll be doing us all a favor (plus you won’t get chest hair in your food!). God uses His Word to speak to us. This weekend was our annual Singles Leader Retreat for church. “Be” was our theme this year and the scripture this was based on was Exodus 14:14 – “The Lord will fight for you; you need only to be still.” We had four sessions and the topics were “Be Present,” “Be Still,” “Be Yourself,” and “Be Grateful.” The session that was most relevant to me right now was “Be Still.” This session was led by John Hambrick and Sue Bates (two members of the staff at Buckhead Church). One thing that John said really hit home with me – “Our purpose is to experience and enjoy God!” To help us better understand this concept, they gave us eight verses from scripture and asked us to go spend an hour alone, praying, reading the passages, and listening to hear what God had to say to us through these scriptures. At first I didn’t think it would take me the whole hour, but the time quickly passed. I just wanted to share these scriptures and what God revealed to me through them (I am linking the verses below to The Message Translation, because I really like how it speaks as we would today). Romans 11:36 – God is the source. Nothing happens to us (challenges, growth, rewards, etc.) without His permission. If it’s something good, He entrusts me and values me enough for me to take on the task. If it’s a challenge or a period of growth, He thinks I can handle it. 1 Corinthians 10:31 – Be present and enjoy what God is doing in your life right now. Don’t let the negativity of others take your joy and your focus away form what is important. Give God the glory! Psalm 19:1-4 – Don’t be so busy that you forget to stop and look at God’s creation. Class is always in session and we can learn so much from just being silent. 2 Peter 1:3-4 – A relationship with God is an investment. You have to spend time being intimate and personal with Him in order to grow in your relationship. Be a participant, not a spectator. Psalm 73:24-28 – God is holding my hand and leading me. He doesn’t force “followship” but He leads tenderly and with wisdom. Desire only God…He is the only thing that lasts. As I grow older God is still strong, firm, and faithful…He never changes. John 17:21-23 – God sent us to be right where we are at this present time and place. He has a reason for our current placement and often we may not understand why, but if we take a step back and look at it from a different perspective we can embrace it and be a part of what God is doing now. God loved us so, we have no excuse for not loving others. Philippians 4:4-7 – Experience and embrace God 24/7. Give people no doubt to Whom you belong. Replace worrying with prayer. When you give your worries to God through prayer, the results are life changing. Psalm 27:4 – Be fully present with God. Observe and acknowledge the beauty of all He has done in and through you. Imagine yourself at the throne of God, in His presence bowing at His feet in reverence. Fear and be awestruck by God. What is God saying to you through these passages? Really?! Please Put On A Shirt! Why is this no longer “normal” in society?! A few weeks ago, I did a post geared toward women that talked about the objectification of men. This post is for the guys out there. I was reading an article today on the New York Times website and the whole point of the article was that it has become “in fashion” (so to speak) for guys to go around the streets of New York with out a shirt. It would be one thing if you were at the beach, the pool, or out running but it talked about guys just out doing errands in the city without a shirt.